Stormy seas, high winds and heavy thunderstorms continue to cause chaos to the whole of the Caranry Islands. 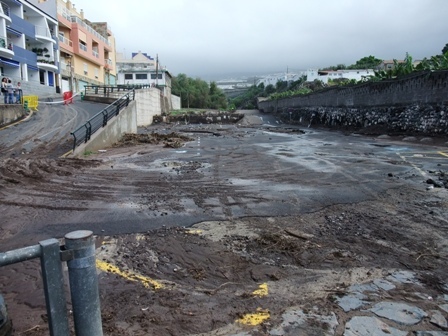 In our local area yesterday heavy metal manhole covers were lifted out of their places by the sheer volume of water causing the closure of the main road in Playa Arena. Today the clean up begins as dozens of council workers clear mud and rocks from the roads. The new beach and car park in San Juan has been badly damaged due to a river of flood water which was too much for the drains. (See pics below) At the time of flooding 2 cars were washed down from the car park on to the beach. Waves of between 4.5 and 5.5 metres have been recorded. 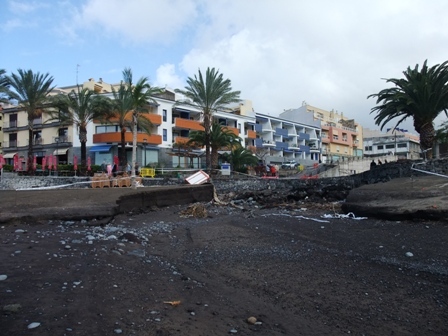 A yacht ran aground on the coast of Puerto del Carmen in Gran Canaria yesterday while the Fred Olsen ferry was forced to return to Tenerife after attempting to enter the port of Agaete in Gran Canaria. Further crossings were cancelled. In Las Calletillas, wind ripped off a gas station roof, which resulted in some people being evacuated from their homes. Schools and universities are closed until further notice and several roads to Mt. 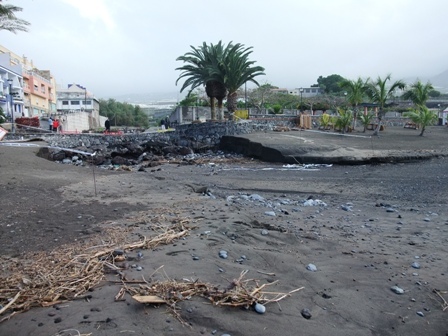 Teide remain closed due to heavy snow, rain or rock falls. Carnival events in Santa Cruz were cancelled yesterday and again today. 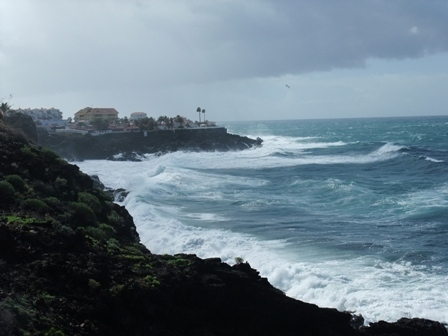 Many places were without power yesterday, and today from around mid day until 4pm the whole of Tenerife was without electricity. Several flights have been cancelled or delayed but all ports, airports and bus services are now operating normally. It’s not over. There are more storms lurking in the Atlantic, due to hit us over the weekend, so don’t put out your garden furniture yet, but it looks like we may have a bit of a reprieve for tomorrow.